Laminate is probably the most common worktop material, and it also tends to be the most affordable option. It’s low-maintenance, and you won’t necessarily need to call in a professional to fit your laminate worktops. If you’re pretty handy or a bit of a DIY-enthusiast, you’ll be able to do yourself. There’s a huge range of laminate types available, so it should be easy to find one that suits your style and budget. As with so many things, with laminate worktops you get what you pay for! Good quality laminate worktops are durable, scratch-resistant and heat-resistant, but cheaper ones may be more susceptible to damage. Perfect for a rustic-style kitchen, hardwoods like oak and walnut look beautiful, especially when paired with Shaker doors like the Washington door in Magnolia, for example. Hardwood doors age well, are more affordable than materials like granite, and will give your kitchen a warm, welcoming feel. They do require a bit of maintenance, however, and can stain and get scratched more easily than other options. Oiling your wood worktops twice a year should keep them in good condition – which isn’t too much of a price to pay for smooth, blemish-free surface! 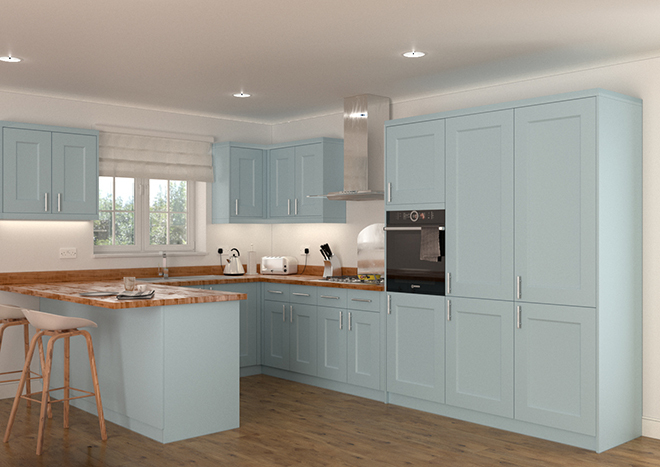 Wood worktops look great with a gentle pastel shade such as Denim Blue. Granite worktops are the epitome of luxury style, and their cost reflects that – be prepared to find that prices start from around £150 per square metre. However, if you take care of your granite worktops, they will last for years and years. Heatproof, hygienic and largely stain-resistant, there are many reasons why granite is such a desirable material to have in the kitchen. It’s worth bearing in mind that a sealant will need to be applied when your granite worktops are installed, and this will need to be redone a few years later. Acidic liquids like citrus juices and wine will damage the stone if not cleaned up immediately too. So if you’re a particularly messy or clumsy cook, make sure you have chopping boards and cleaning products on hand! 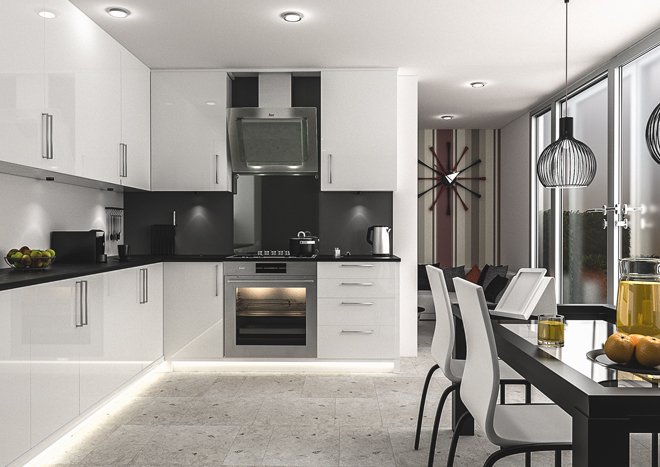 For a modern, monochrome look, pair granite worktops with white gloss doors like the Visions Ultragloss White door. Quartz is a man-made stone material, consisting of naturally-occurring quartz mixed with resin. The addition of resin makes it non-porous, hard-wearing and stain-resistant. Because quartz worktops are man-made, you’ll find a huge range of colours available, so whatever your vision for your kitchen, you’re sure to find the worktops that suit your style. However, there are a couple of disadvantages to quartz work surfaces: they’re not as heatproof as other materials and they’re also not a cheap option – don’t be surprised to find prices that go up to £300 per square metre. Corian and other solid-surface worktops are made from a blend of acrylic resins and minerals. They can be moulded to any shape, meaning you can create an incredibly contemporary kitchen with sink and splashback integrated with your work surfaces. Heat-proof to 250⁰C, stain-resistant and scratch-resistant, solid-surface worktops are quite literally made to suit busy family kitchens. Because of the wide range of colours available, you’ll find the perfect worktop for every type of look, whether you favour a classic style or something more modern. Given the materials and texture of solid-surface worktops, however, we think they look best in contemporary kitchens. Corian and other solid-surface materials aren’t cheap, but are highly practical and will last for years to come. Replaced your kitchen doors recently, or given the whole room a make-over? Share your photos with us on Facebook or Twitter, or drop us an email.